Why is Russia moving so fast? Editor’s note: John Lough is an associate fellow on the Russia and Eurasia Program at Chatham House, a U.K.-based think tank. The views expressed are his own. The speed of Russia's actions in Ukraine has taken many by surprise. While the methods have been seen before – notably in Moldova and Georgia, where Moscow has openly backed separatist regimes with military and economic support – Russia's apparent backing of Crimea's government against the new authorities in Kiev crosses a significant threshold. Since the breakup of the Soviet Union in 1991, Russia has never challenged Ukraine's independence in such a way. 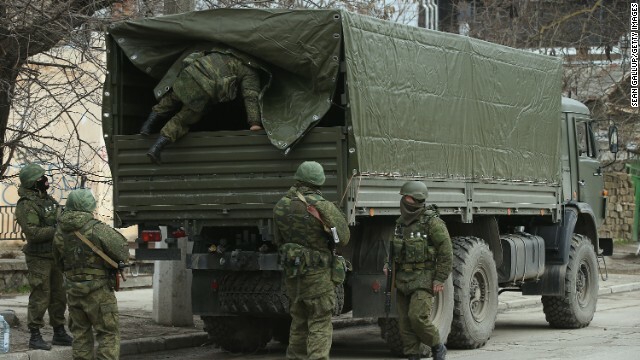 But Russian intervention in Crimea over recent days, and the decision today by the Russian parliament to give President Vladimir Putin the authority to deploy additional forces to Ukraine to protect Russian citizens, marks a significant escalation of the crisis in Ukraine. Indeed, the reality is that if these plans are enacted, they would signify a violation of Ukraine's sovereignty and territorial integrity. In other words, this would in essence be a declaration of war, and would demonstrate Russia's readiness to disregard the principles of the post-Cold War security order enshrined in the 1990 Paris Charter, as well as its commitment in the 1994 Budapest Declaration to respect Ukraine's independence. The decision appears reckless and, unlike previous occasions, does not have even a fig leaf of legitimacy. The new authorities in Kiev have not threatened or used force against Crimea, nor have they shown any intention to endanger the lives of Russians in Ukraine. So why has Russia moved so fast? Moscow's readiness to escalate the crisis in Ukraine reflects panic at what it undoubtedly sees as a potentially dramatic loss of influence in the country as a result of the "Maidan" revolution. It has calculated that the risks of not intervening in Ukraine are greater than those of intervening, even though those risks include the danger of provoking widespread violent conflict and a serious breakdown in relations with the West. Regardless, Russia's earlier strategy is in shreds. It bet heavily on the survival of Ukrainian President Viktor Yanukovych, in effect offering him late last year a $15 billion bailout package and other sweeteners in return for not signing an association agreement with the European Union. Russia looked to have outmaneuvered the European Union and to have kept Ukraine firmly in its sphere of influence. After all, the association agreement with the EU, if implemented, would have laid the foundations for anchoring Ukraine in the west. Since then, however, Moscow has been stunned by the speed at which Yanukovych's rule collapsed. It blames the West for fomenting the revolution and seems to believe that it needs to counter an unprecedented surge of Western influence in Ukraine and prevent the consolidation of the revolution. By signaling its readiness to support the secession of Crimea, Moscow is opening the door to further unraveling of Ukraine by encouraging supporters of closer ties with Russia in Ukraine's eastern regions to call for Russian protection and not to recognize the authority of the interim government in Kiev. All this could easily make it impossible to hold the presidential election scheduled for May 25 in those parts of the country that identify strongly with Russia. The scenario of Ukraine's partition has moved significantly closer. Simon says the actions of Vladimir the First are no different from those of President James K. Polk. Simon says the actions of Vladimir the First are no different from those of U.S. President James K. Polk. Amen @ tom and your 4:59 post! Putin is nothing more than a thug who doesnt give a crap about his own people much less anyone else! And Obama at least has the good sense not to rush into another war that we cant afford nor do we want! And why do you think that is...because HE cares about ALL people! Probably the main reason that the Republicans have been so dead set on fighting ANYTHING he tries to do! It is 100 years since WW1 and a similar scenario started it. Armed with the benefit of hindsight the West has learned the lessons but not Russia who is still many years behind due to its development is a straight-jacket of successive dictatorships. Putin is afraid of his own people and feeds them with 60 year old propaganda. Intelligent Russians know this and democratic developments in Ukraine would be taken up in Russia too if Putin was not strong. The lesson Russia needs to heed is very simple – the law of Karma – whatever you give out – you will also receive. Sowing the seeds of greatness or seeds of wrath – it is your choice and why Russia will never have real lasting peace until it owns up to this reality. Study the profound 59 slogans buddhism on your eastern border countries. They are carved in stone but rarely understood and bever appreciated. It is best to be compassionate to all people and not just selfish aims. Everyone desrves better 100 years on. Remember your Allies from 100 years ago and 60 years ago. We came to Russia's aid then – we all deserve to be respected too. Russia thinks up bogey-men where none exist. This article ignores the two biggest reasons why Putin acted quickly. The first reason is the oldest in diplomacy – a fait accompli. Throughout history, nations have often ignored these types of occupations once they were accomplished and it seemed that nothing could be done about it. Putin's second reason is that he sees the US, and Obama as weak. He sees America as weak because of our debt and our divisiveness. According to him we can't even agree on how to balance our checkbook so, clearly, we won't be able to agree to resist him. He sees Obama as weak because Obama is very aware of our debt and how tired Americans are of wars. Obama is trying to avoid both. Ultimately, Putin is wrong about both America's and Obama's weakness. Historically, America, and our presidents, have put up with a lot. However, when people like Putin choose to interpret our forbearance as weakness and then keep pushing, they tend to provoke a strong American reaction once we've had enough. Despite debt and war-weariness, Obama will strike back when he's been pushed too far, just as all American presidents have. One example – Khrushchev thought Kennedy was a pushover until Kennedy got fed up and used the US Navy to blockade all of Cuba. If Putin keeps pushing he will find that he is not ready for an American backlash. The west needs to show vladimir stalin that it will intervene militarily in ukraine or seal off the kaliningrad oblast, soviet war booty stolen from the gernans, if the russians invade. For a kgb apparachnik like vladimir stalin,"that is all he will understand. Real force and the threat of the dismembering of the russian federation. Ukraine and Crimea now. Next step? Too many Russians in Finland, buying property etc and the govt pandering to Moscow. The Finns should stronglt demand the return of Karelia and their former arctic port of Petsamo. Keep out of Finland tsar Putin!